The world of ultra-high definition (or 4K) video is at our doorsteps. As displays become affordable and content sources increase, 2015 is shaping up to be the year of 4K. 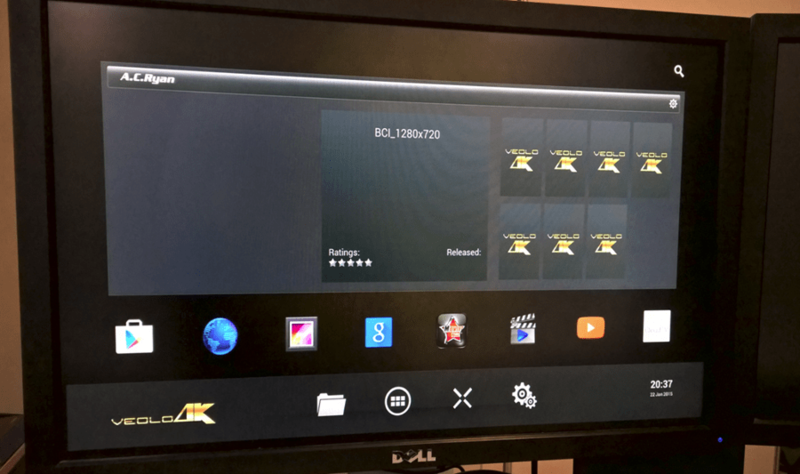 Surprisingly, there’s not many set top boxes available that support video playback at 3840×2160 resolutions. A.C.Ryan have created a media player that is 4K enabled and will set you up to consume 4K content as more of it becomes available. The relatively small box packs a punch with a Quad-Core A17 ARM Processor, it’s powerful enough to push the content, while remaining fanless, critical in achieving the best movie experience. The device supports 4K H.264 or the newer H.265 codec, as well as MKV and BD-ISO. Of course you can insert media via MicroSD cards or USB drives, but more commonly you’ll source your content from online. 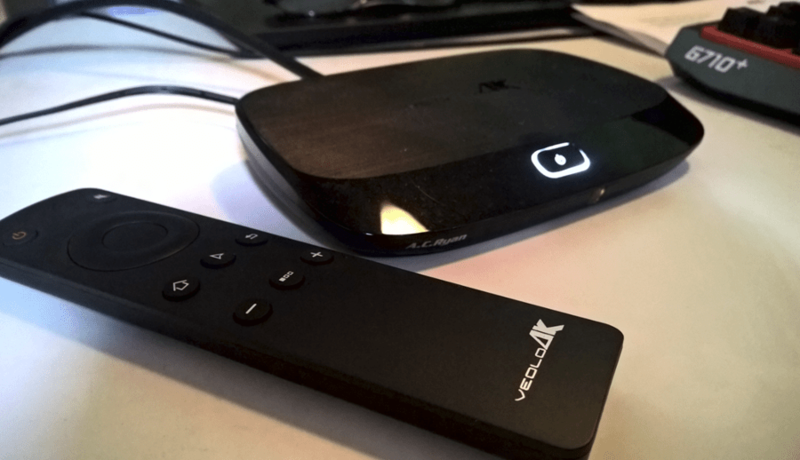 The VEOLO 4K Media Player features Gigabit Ethernet as well as Dual-Band WiFi. With support for 2.4GHz and 5GHz bands, you can prioritise traffic to make sure your playback is uninterrupted. Pushing the data required for a 4K is a challenging task in Australia and you’ll likely need the NBN or cable internet in metro environments for the best experience. 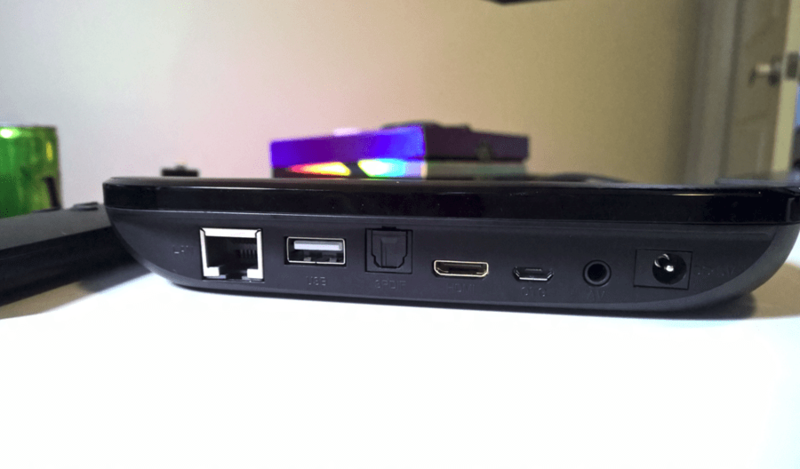 The VEOLO 4K Media Player is really not much bigger than a large smartphone, a little longer, little higher, but compared to a full blown DVD player or console, it’s tiny. Many devices on the market like the Apple TV can play 1080p from a small package, but the important point here is that increasing the resolution by 4 times, doesn’t require extra physical space. A testament to power of modern processors. Connectivity is straight forward, just connect power and HDMI and you’re away, if you need optical audio out, it’s there. Personally I run all inputs into the TV, then optical out, but each to their own. 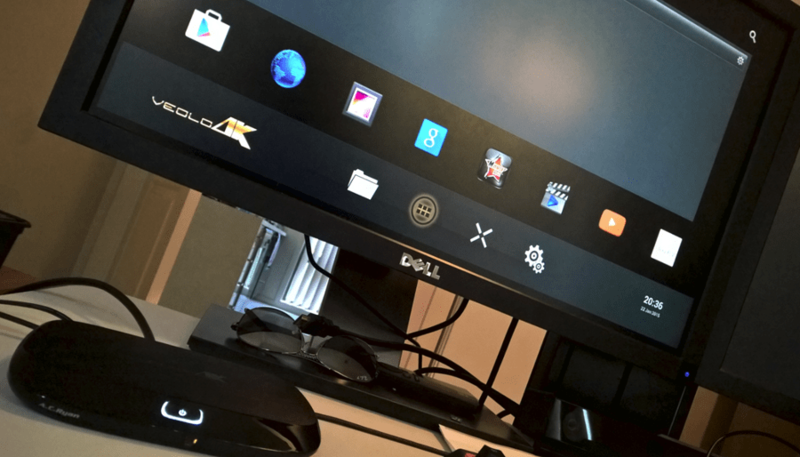 While many of the photos in this review are of the device connected to the aged, 27” Dell monitor, I did get some time during the last review of the ViewSonic 4K display to really test the VEOLO’s ability to playback 4K smoothly. This is where the device succeeds the most. Playback was smooth and looked brilliant. One of the first tests was to fire up the YouTube app and head to the 4K content. It’s clunky having to navigate with the mouse on the remote, but having bluetooth, you can connect a wireless mouse. After navigating to the quality setting and hitting 2160p, the video took some time to buffer on an ADSL2+ connection. I went and made a coffee and then returned to hit play and enjoyed the stunning next generation quality. Whatever you think of the interface and the OS, it’s all forgotten when you hit play on 4K. 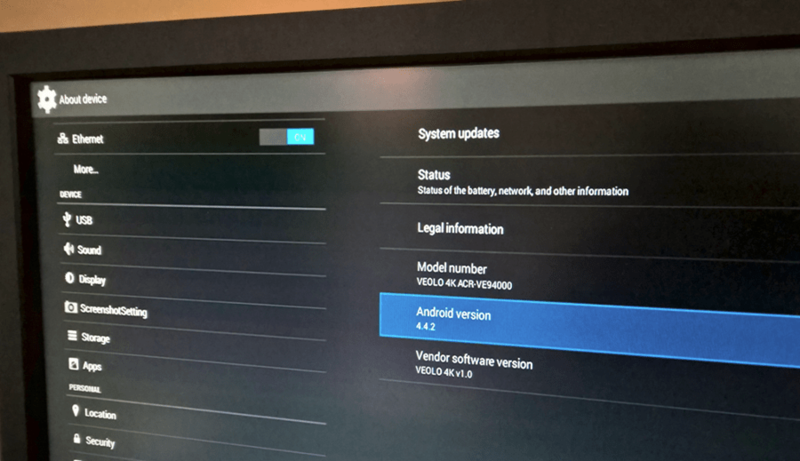 The VEOLO 4K Media Player runs a cusotmised version of Google Android 4.4.2. At this point anything less than Lollipop is disappointing, but hopefully updates are on their way. The main interface features a feature area for media, you can add sources from internal, external and network storage. Unfortunately none of the content I had would load thumbnails, but have seen a completed UI that looks more visually impressive. Below the feature pane, there’s an area to pin your favourite apps. This device does have the Google Play Store which allows you to install all your favourites, but don’t expect all to work well with a remote. If you really want to use this in a material way, you’ll want some derivative of mouse and keyboard on the couch. There are applications that come pre-installed (These are made by 3rd parties, no AC.Ryan) on the VEOLO that obviously stem from it’s Singaporean development. Some applications offer internet streams of the latest hollywood movies, as in the ones still in theatres like Birdman and American Sniper, all for free at the click of a button. This can’t be legal, not in Australia. 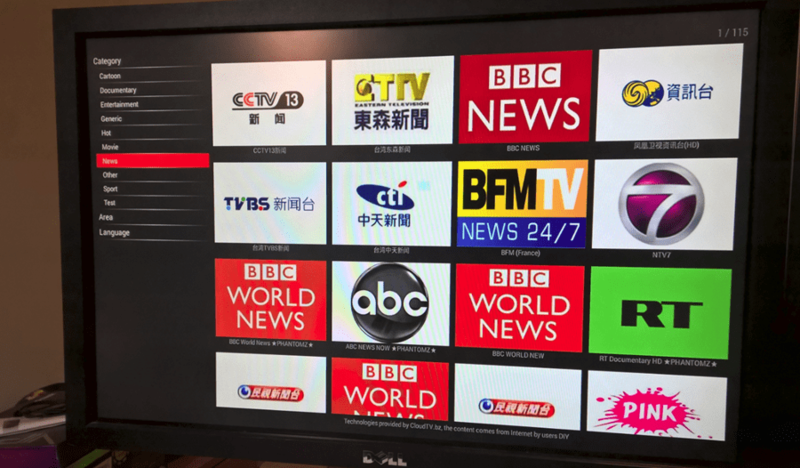 Other apps offer internet streams from international TV stations like ABC, BBC, etc and then of course there’s the myriad of channels in Asian that as an English-only speaker, didn’t appeal to me. There’s no question these same content sources are available to anyone who searches in Google. For example ‘live stream of F1’ will result in plenty of options to streaming the F1 to get around geoblocking. It’s another thing to ship a product with the type of sources supplied. It’s an absolute user-first focus here. After publishing the review, we’ve had some clarification around this interface. The VEOLO 4K’s main UI, is known as a Jukebox and automatically grabs cover art & synopsis for your movies/ dramas but they’d have to have the right name. A file named “Avatar” will work with the UI, but a file named “disc1.iso” wouldn’t – even if it is ripped from the original Blu-Ray disc because the system wouldn’t be able to reference against that title. Downloading UHD content and then playing back on the VEOLO 4K is definitely one of its top attraction – especially with support for HDMI & S/PDIF Bitstream up to 5.1 Surround Sound. A.R.Ryan believe most will also setup their NAS/ media server for 24/7 downloading, and then utilizing the VEOLO 4K, stream these (ultra) high quality media over the home/ office network. If you’re thinking about getting this device and watching 4K Netflix, you should know only approved displays are currently able to achieve that quality, so you’ll be out of luck there. 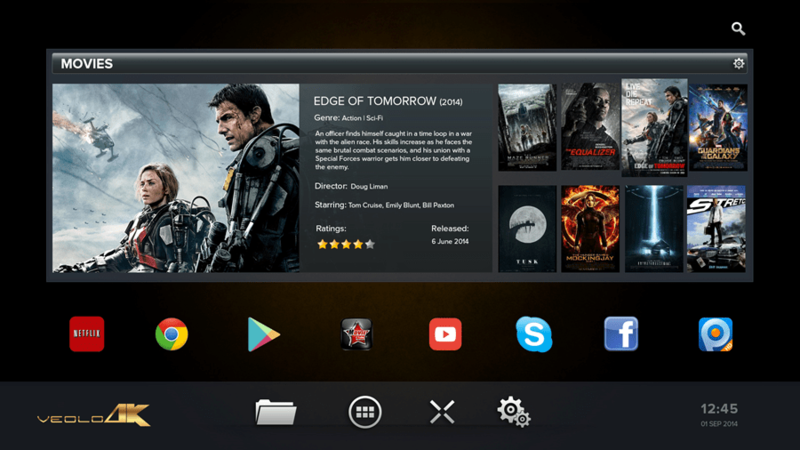 There are however a multitude of streaming services, Kodi as an open-source platform is one good source for high quality content, with the use of 3rd party add-ons and YouTube as we mentioned earlier. A.C.Ryan are currently in talks with a few key distributors so fans can expect the VEOLO 4K to reach Australian shores by end Q1 2015. For now, it is available online on our web store for S$299/ A$273. It’s a solid device that’s space efficient and has no fans, so is silent. I found it has no problems playing back 4K content, no signs of stutter or blur, just solid. The UI could do with some polish and of course material design with Lollipop, but the weirdest decision is the one to include questionably illegal content sources. I’m not sure how I feel about this, in a way, users will love it and if you’re the bit torrent type, this really skips a download step and lots of time. The sources for 4K content will be solved, largely by internet distribution, but one real asset of this is the ability for those creating 4K content, to snap in a Micro-SD card or USB drive and play it back for others. This device is also more about future proofing a purchase, getting something that will play content regardless of it’s quality. SD, HD, UHD, this does it all. Buying a media player in 2015, this should be your expectations and avoid the need to upgrade later when the 4K capable TV arrives in your lounge room.